For the past 25 years, we at Currey & Company have been known for our distinctive and diverse offerings, specifically within our lighting collections. From the prim elegance of our Lillian Chandelier, and the colorful whimsy of The Marjorie Skouras Collection, to the sophisticated modernism of the NEW Haywood Chandelier, our products and designs have the ability to span a wide-ranging aesthetic and to become the polestar of any space. 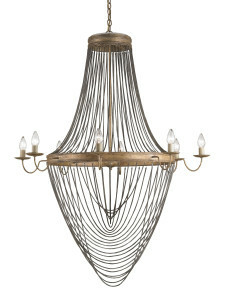 Our newest collection of chandeliers is certainly no exception. On the back of the Fall High Point Market, we are pleased to highlight some of our favorite lighting pieces from the latest Currey & Company introductions. 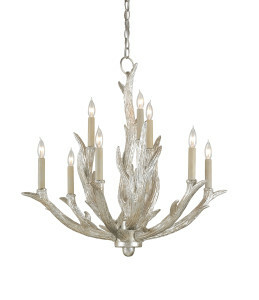 An elevated take on the rustic antler trend, the Haywood Chandelier is both understated and refined. The Haywood Chandelier also has a matching wall sconce. 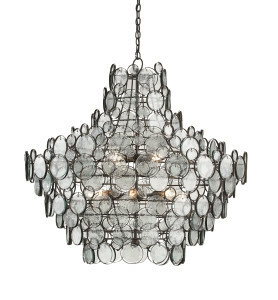 In two show-stopping sizes, the Lucien Chandelier is a testament to old world style while still being clean and sleek. The chain-mail style cord is draped methodically and intentionally in a criss-cross pattern over the French Gold Leaf frame, giving the Lucien a compelling and artistic feel. 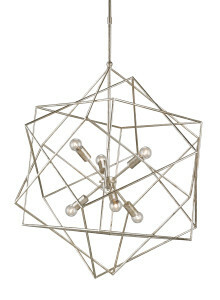 A series of cubes set at various angles and finished in Contemporary Silver Leaf; the Aerial Chandelier is both modern and whimsical, and the quintessential embodiment of a light show. One of the most magical things about these luminous fixtures is how the light filters through the materials to create a true light show on surrounding surfaces. This entry was posted in Currey & Company, Products and tagged Chandeliers, design trends, glass, Lighting, Modern, Rustic, Silver on November 12, 2013 by Currey & Company.